Product #21348 | SKU H-NS043E | 0.0 (no ratings yet) Thanks for your rating! 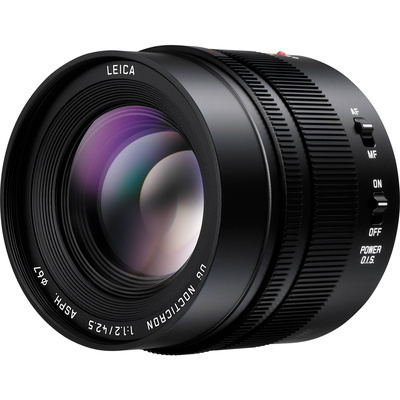 Characterised by its fast and sophisticated optical design, the Leica DG Nocticron 42.5mm f/1.2 ASPH. POWER O.I.S. from Panasonic is an 85mm equivalent prime for Micro Four Thirds mirrorless cameras. The fast f/1.2 maximum aperture benefits working in difficult lighting conditions and also affords more control over focus position for producing shallow depth of field imagery. The lens's optical design employs a pair of aspherical elements, one UHR element, and one extra-low dispersion element to reduce both spherical and chromatic aberrations for improved sharpness and clarity. Additionally, a Nano Surface Coating also enhances contrast and colour fidelity by reducing lens flare and ghosting. Complementing the optical attributes, this lens also distinguishes itself with a POWER Optical Image Stabiliser, which minimises the appearance of camera shake for sharper handheld shooting. A stepping AF motor and internal focus design also offer fast and near-silent focusing performance that is ideal for both photo and video applications. Portrait-length prime is designed for Micro Four Thirds mirrorless cameras and provides an 85mm equivalent focal length. Exceptionally fast f/1.2 maximum aperture offers notable control over depth of field for working with selective focus techniques and also benefits shooting in low-light conditions. Two aspherical elements and one Ultra-High Refractive Index element help reduce spherical aberrations and distortion for improved sharpness and accurate rendering. One extra-low dispersion element controls chromatic aberrations and colour fringing for greater clarity and colour accuracy. A Nano Surface Coating minimises surface reflections throughout the entire visible spectrum for maintained contrast and colour fidelity with a marked reduction in lens flare and ghosting. POWER Optical Image Stabiliser (O.I.S.) minimises the appearance of camera shake to realise sharper imagery when shooting handheld.